Heart-pounding suspense and razor-sharp tension highlight this highly-acclaimed thriller. 17-year-old Travis, secure within a desolate home with his protective and heavily armed parents (Joel Edgerton and Carmen Ejogo), watches his world abruptly change with the arrival of a desperate couple (Christopher Abbott and Riley Keough) and their young child. Panic and mistrust grow as the dangers of the outside world creep ever closer… but they may be nothing compared to the dangers within. A small group of characters hole themselves up in an isolated location while they try to keep potential outside dangers from getting in. It's a common horror/thriller setup -- but what happens when the external menace starts to take a backseat to threats far more internal in nature? What happens when the true danger is already inside? 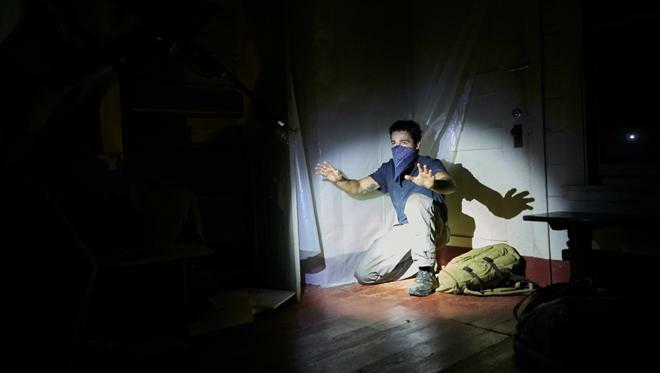 Trey Edward Shults' It Comes at Night attempts to play with those very questions, placing a heavy psychological spin on its genre conventions. But while the movie's more cerebral take is admirable, the uneventful payoff might actually leave some viewers wishing for a good old zombie or machete wielding maniac instead. 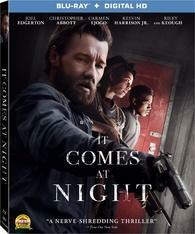 As an unknown sickness spreads throughout the world, Paul (Joel Edgerton), Sarah (Carmen Ejogo), and their 17-year-old son, Travis (Kelvin Harrison Jr.), attempt to survive by quarantining themselves in a secluded house in the woods. But when another family joins them, suspicion and fear could cause a dangerous rift between the survivors. With the threat of infection ever-present, the group attempts to get by without succumbing to their most desperate impulses. Dropping us into the film's post-apocalyptic setting without any preamble, the director eschews exposition in favor of directly showing us the terrible realities of this bleak world, revealing the outbreak's heavy personal cost right upfront in the opening scene. From there, the movie oscillates between quiet stretches of increasing desperation and punctuating moments of tense action, mixing intimate character interactions with violent bursts of mistrust and fear as the two families get to know one another and fend off threats. All the while, the director keeps the runtime wholly contained within the dimly lit interiors of the single house location and its surrounding forests, using the insulated setting to ramp up the film's gradually building sense of panic and dread. A sense further amplified by intermittent dream sequences. Giving horrifying form to Travis' internal anxieties, these nightmare scenes offer a vague yet potent glimpse into the psychological effects of societal collapse. And to subtly reinforce this atmosphere of tightening unease, the director even horizontally compresses the aspect ratio of these sequences, making it feel as if the world is closing in on the characters. Meanwhile, in the waking world, long takes, lingering shots, and roving camera movements all help to engender a delicately haunting aesthetic, sustaining the tension of key scenes as mistrust festers between the ensemble and the line between protagonist and antagonist begins to blur. But as solidly crafted as the movie's unsettling atmosphere and character dynamics can be, the film's narrative doesn't ultimately amount to all that much and there are pacing concerns throughout. Despite some decent beats between the cast, lulls in the runtime drag down certain stretches. And when all of the script's ominous foreshadowing does finally payoff, the results are a bit anticlimactic. Likewise, the whole affair ends up feeling quite familiar. Post-apocalyptic chamber pieces like this focused on the dark side of human nature are common place on the festival circuit, and many viewers will likely feel like they've already seen this type of material examined in more effective ways many times before. While the story is filled with strong themes tied to survival, mistrust, and fear, and there are some engaging sequences throughout, the movie never fully develops any of them into anything particularly deep or original. The third act certainly holds some weight, but the final scenes don't quite hit with the intended impact. Instead, the movie just peters out toward a conclusion that always felt inevitable with very few twists or detours along the way. I kept waiting for some notable revelation to help spice up the plot or bring new relevance to all the buildup that came before, but little ever materializes. Don't get me wrong, stories with a more restrained scope and internal focus like this can of course be very powerful. In this instance, however, it feels like something key is missing, preventing the premise from evolving into something truly unique or affecting. Though It Comes at Night is still a worthwhile effort, it's ultimately more likely to elicit a half-hearted shrug than any kind of lasting impression. Lionsgate presents It Comes at Night in a Blu-ray/Digital HD combo pack. A BD-25 Blu-ray disc comes housed in a keepcase with a cardboard slipcover. Instructions for an UltraViolet digital copy are included as well. After some logos and skippable trailers, the region A disc transitions to a standard menu. The movie is provided with a 1080p/AVC MPEG-4 image in the 2.39:1 aspect ratio (though some scenes shift to 2:55:1 and 3.00:1). Appropriately dark and moody, the modest picture comes through without any major transfer-related quirks. Shot on the Arri Alexa XT, the source features a moderate layer of digital grain, giving the image a textured, film-like appearance -- though some dark shots can veer toward a nosier look. Detail is strong throughout, revealing every dirty speck of wear and anxiety on the characters' faces. Outdoor scenes during the day tend to be the most traditionally impressive, offering a nice sense of dimension. The movie is predominantly shot in low-light interiors, however, and these sequences can be a tad softer. Colors adhere to a fairly drab and under-saturated look, but this style suits the bleak material very well. Contrast is nicely balanced, revealing bright whites and highlights (flashlights, fire) against the otherwise dark imagery when called for. With that said, while shadow detail is solid, black levels have a comparatively grey appearance. And since the darkest portions of the picture are noticeably lighter than the letterbox bars above and below the frame, certain aspect ratio shifts during fades to black can appear rather jarring. Thankfully, I detected no notable digital artifacts or signs of compression. Marked by an intentionally stark and isolated aesthetic, It Comes at Night hits Blu-ray with a modest yet effectively haunting style. The image has a grainy appearance in darker scenes and blacks are never quite inky, but this rougher look is seemingly deliberate. The film is presented with an English DTS-HD MA 5.1 track, along with optional English SDH and Spanish subtitles. Juxtaposing long stretches of subtle ambience with key bursts of aggressive effects work, this is a potently crafted mix. Dialogue is mostly clear during important conversations, but characters do have a tendency to whisper and there are a couple instances where speech is muffled a bit by gas masks that the cast wears, making it a little hard to make out a few lines. Atmospherics are nuanced and nicely layered throughout, spreading quiet nature effects like rustling trees and chirping crickets around the soundstage. Directionality is also strong, transitioning certain noises (like creaking footsteps) to the left, right, and surrounds with smooth imaging from speaker to speaker. Dynamic range is quite impressive as well, offering an appropriately startling burst of loud, aggressive audio in between the film's otherwise restrained mood. Agonizing screams, piercing gunshots, ominous knocks, and forceful music cues all contrast powerfully against the stillness of the movie's isolated setting, and LFE kicks in nicely during these tenser sequences. Despite some occasionally soft speech, the track does an excellent job of creating a secluded and dangerous soundstage, perfectly complementing and enhancing the film's uneasy atmosphere. Human Nature: Creating It Comes at Night (HD, 30 min) – Presented in 1080p with Dolby Digital 2.0 audio, this is a solid behind-the-scenes doc with cast & crew interviews and on set footage. The participants elaborate on the movie's origins, casting, story, characters, themes, cinematography, locations, editing, sound design, and score, rounding out a worthwhile look at the film's production. Audio Commentary – Writer/director Trey Edward Shults and star Kelvin Harrison Jr. sit down for this track. The pair offer a laid back discussion touching upon the origins of the script, shooting style, and casting, while detailing how certain scenes were planned and blocked. Likewise, the duo even addresses some friendly disagreements they had during the shoot, shedding some light on the collaborative process. Trey Edward Shults' It Comes at Night is an occasionally gripping yet ultimately flawed effort. The film's psychological focus examines some thoughtful themes related to fear and survival in a post-apocalyptic world, but the build-up doesn't ultimately amount to much. From a technical perspective, this disc offers a strong video and audio presentation, preserving the movie's moody atmosphere. Likewise, the included commentary and behind-the-scenes doc provide some decent insights into the production. Some viewers will likely be turned off by the film's slow pacing and internalized style, but the flick's atypical approach to horror definitely has its moments. Worth a look.